Murky Memories: Rich ‘n Chips cookies were one of two premium chocolate chip cookies offered by Keebler in the ’70s and early ’80s. There were the Coconut Chocolate Drops (which are still sold today but under the name “Chips Deluxe Cocnut Cookies”) and Rich ‘n Chips. 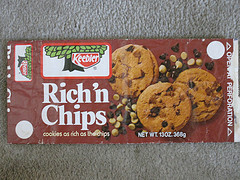 Rich ‘n Chips were cookies with both chocolate and butterscotch chips, and they were my father’s favorite type of cookie. We still add butterscotch chips to every homemade batch of chocolate chip cookies we make. Whenever I go to the grocery store, I still search for these even though they have been discontinued for more than 20 years. Not-so-Murky Memories: Ten years ago, from right this very moment, my wife and I were sitting in Chilton Hospital, in Pompton Plains, NJ. It was nearly midnight, the eve of September 5th, less than 36 hours before my wife’s 30th birthday. She had begun having contractions about 4 hours ago, but having received a good dose of pain killers, the contractions seemed to have subsided for now. It had looked like our first child might be born on the 5th, but now all signs pointed to a September 6th birthday. While Mary rested, I watched the hospital television. To my amazement, the episode of I Love Lucy where Lucy gives birth to her baby was on. I’ll always remember that. Tomorrow, or rather in a few hours, Jay turns 10. It went by so fast, and there are so many things I didn’t get to do with him yet. I hope I have the chance to do some of them, while they’re still of interest to him. What I can say, though, is that I’ve loved every moment I’ve been able to share with him so far, and I feel so lucky that he is my son. We often call him the greatest birthday gift my wife ever got, and to me he’s simply the greatest gift she (or anyone) ever gave me. Murky Memories: My first trip to Chilis was in 1983. I was living in Englewood, CO at the time. Chili’s was this awesome place that had dozens of different types of hamburgers, and not much else. There was the Chili’s Trip, the Oldtimer (with or without cheese), more than 20 others. The Englewood location was one of only a handful, and it was a special place to go. You can see in the Wikipedia entry that the founder of Chili’s sold the brand and his 20 or so locations (primarily in the southwest) at around that time. And while Chili’s has become a thriving restaurant chain, it’s not the Chili’s I knew and loved. It’s okay… but it’s not the same. The same thing happened to “T.G.I. Fridays”… two years earlier, I had first eaten at a Friday’s restaurant in San Diego, CA. Potato Skins were a speciality, and all different varieties were offered (Pork n Beans, Parmigiana, the traditional we all know now with cheese and bacon)… but I digress. Man of Steel was a reboot… with a more simple, less powerful, Superman. The origin story changed considerably, Superman’s abilities differed, the roles and nature of the supporting cast changed as well. And it was for the better. As much as I dislike reboots, this one helped the character and accomplished its goal. Well done, DC. Murky Memories: Chunky Bars were most commonly found wrapped in silver wrappers and they had raisins in them. At the time, that was a big turn off for me. But there was another, hard to find, variety… wrapped in gold. It contained nuts (pecans actually) instead of raisins. I thought it would be outstanding (since I didn’t care for the raisin filled silver one but loved chocolate covered peanuts)… it was all right. I’m not a big fan of Nestle’s chocolate over that from other companies, but it was okay. Little did I realize it would soon vanish from the Earth.